An aberrant origin of right subclavian artery is the most common aortic arch anomaly that occurs in approximately 0.5%–1.8% of the population. This aberrancy is a rare cause of dysphagia in adults commonly known as dysphagia lusoria. The patients are usually asymptomatic. Symptoms if present commonly include dysphagia, cough, and stridor, which denotes compression of the involved structure. Of these, dysphagia is the most recognized symptom. Chest pain and Horner's syndrome are some of the rare occasional presentation of this congenital vascular anomaly. The aberrant subclavian artery is usually associated with a broad base known as Kommerell's diverticulum which may undergo aneurysmal degeneration, associated with a high incidence of rupture if untreated. Our detailed literature search, we failed to identify a similar clinical presentation of aberrant subclavian artery at 50 years of age with tracheoesophageal fistula. Condition simulates the presentation of advanced carcinoma esophagus usually common in this age group. Hence, we decided to report it for educational purpose. A 50-year-old lady presented to us with a history of progressive dysphagia for the last 2 years and progressive cough for the last 2 months. Dysphagia was to both solid and liquids. There was no history of any corrosive intake. She had a history of progressive weight loss which was unrecorded. A provisional diagnosis of carcinoma esophagus was made elsewhere and the patient was advised barium swallow study of esophagus. Early phase of barium study revealed dye leaking into tracheobronchial tree due to which study was terminated [Figure 1]. 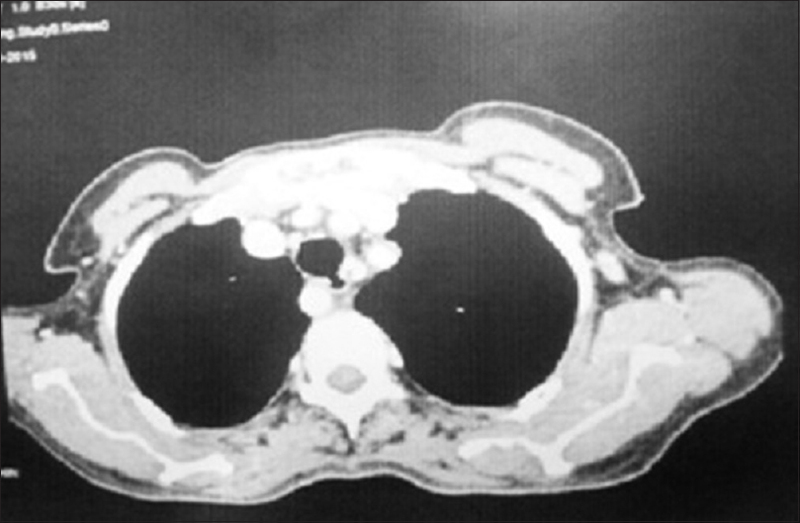 The patient was referred to our center for palliative management of carcinoma esophagus. Upper gastrointestinal endoscopy at our center revealed extraluminal compression of esophagus in upper thoracic part with small perforation 24 cm from incisors. 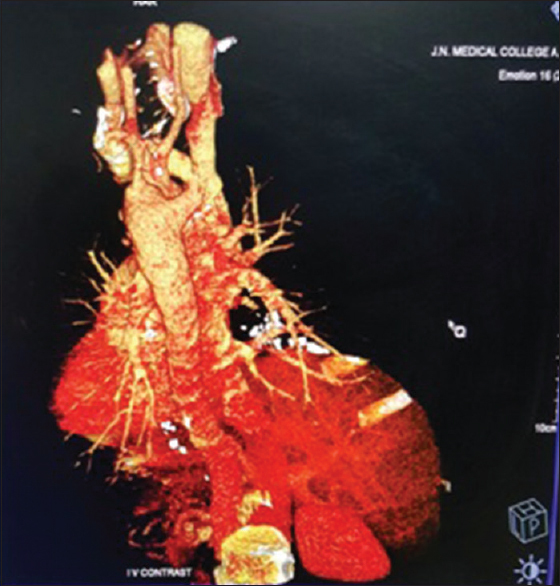 We evaluated the patient with contrast-enhanced computed tomography (CECT) of chest. CECT chest revealed aberrant right subclavian artery arising distal to left subclavian artery from aortic isthmus with retroesophageal course with total esophageal occlusion with small perforation of esophagus into trachea just above the occlusion [Figure 2] and [Figure 3]. 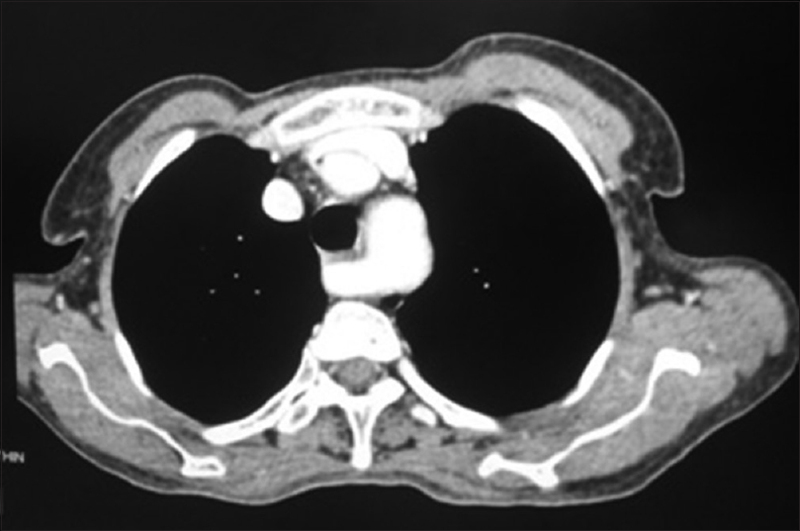 Three-dimensional reconstruction of available contrast computed tomography (CT) of chest clearly revealed an aberrant right subclavian origin with retroesophageal course [Figure 4]. However, there was no Kommerell's diverticulum which is usually associated with severe forms of dysphagia lusoria associated with aberrant right subclavian artery. 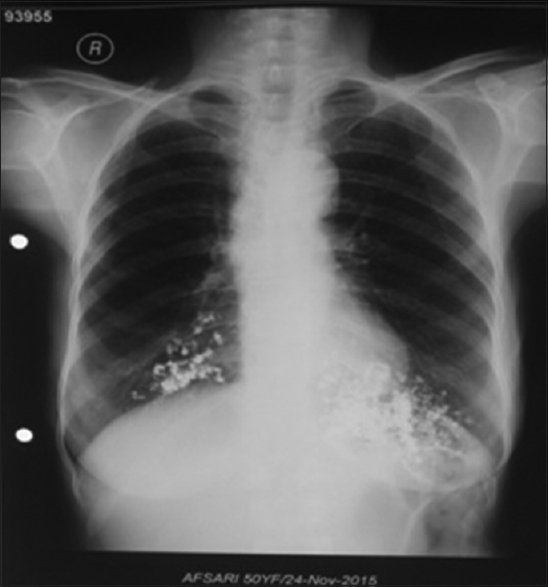 Clinically, the patient was cachexic due to chronic malnutrition and was having features of aspiration pneumonitis. Broad-spectrum antibiotics were initiated. A feeding jejunostomy was done to improve patient's nutrition. Following surgery over subsequent days, her chest condition deteriorated. Bilateral pneumonitis progressed to acute respiratory distress syndrome and multiorgan dysfunction. She was kept intubated with pulmonary toileting. She succumbed to generalized sepsis on the 10th day of admission. Edwards et al. analyzed and first explained the abnormal origin of the right subclavian artery by involution of the 4th vascular arch with the right dorsal aorta. He proposed that persistent 7th intersegmental artery attached to descending thoracic aorta becomes aberrant right subclavian artery that often follows a retroesophageal course. When aberrant, the artery comes off the aortic arch beyond the left subclavian artery and crosses the midline. Course of aberrant right subclavian artery is mostly dorsal to the esophagus (80%). It may also pass between the esophagus and the trachea (15%) or even anterior to the trachea (5%). Aberrant artery most commonly arises from the posterolateral portion of the arch of aorta. In our patient, aberrant right subclavian artery was arising distal to left subclavian artery from aortic isthmus with retroesophageal course. Abnormalities commonly associated with aberrant right subclavian artery may be of interest to the clinicians. Common carotid trunk is often associated with aberrant right subclavian artery. In such cases, the ipsilateral vertebral artery may anomalously arise from the common carotid artery and may have an anomalous point of entrance into the cervical spine. The thoracic duct may abnormally drain at right jugular-subclavian junction. A nonrecurrent laryngeal nerve, important during thyroid surgery may abnormally extend almost directly across from the vagus nerve to the laryngeal territory., In our patient, no other anomaly of the aortic arch was found. Symptoms of aberrant right subclavian artery usually arise from the compressive effect of the artery or aneurysm on the surrounding structures. Dysphagia is the most common and best recognized symptom and gave rise in the past to the term, dysphagia lusoria. Dysphagia is primarily for solid foods but may be absolute for liquids as well in severe cases. Dysphagia may be associated with regurgitation of the undigested food, persistent cough, postprandial bloating, and occasional chest pain frequently changing with body positions. Thoracic outlet syndrome or Horner's syndrome may be the first presentation of the disease. In rare cases, patients may present with ruptured aneurysmal aberrant artery or Kommerell's diverticulum. The presence of aneurysmal dilatation of the aberrant right subclavian artery or Kommerell's diverticulum increases the incidence and severity of dysphagia. In our patient, the only complaint of dysphagia was of short duration of 2 years that developed in patient at an age of 50 years. The absence of diverticulum could have been the possible cause of delayed onset of symptoms in our patient. Our patient also had a 2-month history of postprandial coughing for the last 2 months probably due to the development of tracheoesophageal fistula. This presentation is quite similar to carcinoma esophagus presenting with tracheoesophageal fistula a common cause of dysphagia in this age group. The physical examination in cases of aberrant subclavian artery is usually normal  as was in our case. Endoscopy may reveal a pulsatile, shelf-like extrinsic compression in the posterior wall of the esophagus, with intact mucosa. However, in our case, endoscopy could only reveal external compression of esophagus with small perforation. The diagnostic modalities available to visualize an aberrant right subclavian artery include barium swallow, CT angiography, and magnetic resonance imaging (MRI). Barium swallow in cases of aberrant artery may demonstrate a diagonal indentation caused by extrinsic compression over the proximal posterior esophagus at the level of third thoracic vertebra. The study was not useful in our case due to the presence of tracheoesophageal fistula causing aspiration pneumonitis. CECT or MRI confirms the findings of barium swallow. In addition, they can show the exact relationship of the anomalous vessels with surrounding structures such as esophagus and trachea. Vascular changes in the aberrant vessels such as atherosclerosis, aneurysm formation, and diverticulum are equally evident on CT or magnetic resonance angiography. The management of patients with aberrant right subclavian artery with dysphagia primarily depends on the severity of the symptoms. The patient with mild to moderate symptoms can often be treated symptomatically, with lifestyle and dietary modifications. In patients who do not respond to conservative therapy, surgical intervention is justified. Keeping in view, poor nutritional status of the patient we planned feeding jejunostomy as first surgical procedure. Repair of tracheoesophageal fistula through the right posterolateral thoracotomy and right subclavian to right carotid transposition transposition through supraclacivular approach was planned at the second stage. Placing intercostal muscle flap in between tracheal and esophageal repair greatly helps in healing of fistula and was also planned. Our patient could not be revived from aspiration pneumonitis and definite repair could not be done. We lacked extracorporeal membrane oxygenation facility at our center which could have been useful treating respiratory failure in our patient. In conclusion, aberrant right subclavian artery may have unusual presentation in adults. Patients with suspected dysphagia lusoria should be carefully evaluated and managed subsequently to avoid unfavorable outcomes. Richardson JV, Doty DB, Rossi NP, Ehrenhaft JL. Operation for aortic arch anomalies. Ann Thorac Surg 1981;31:426-32. De Luca L, Bergman JJ, Tytgat GN, Fockens P. EUS imaging of the arteria lusoria: Case series and review. Gastrointest Endosc 2000;52:670-3. Stone WM, Brewster DC, Moncure AC, Franklin DP, Cambria RP, Abbott WM. Aberrant right subclavian artery: Varied presentations and management options. J Vasc Surg 1990;11:812-7. Brown DL, Chapman WC, Edwards WH, Coltharp WH, Stoney WS. Dysphagia lusoria: Aberrant right subclavian artery with a Kommerell's diverticulum. Am Surg 1993;59:582-6. Kau T, Sinzig M, Gasser J, Lesnik G, Rabitsch E, Celedin S, et al. Aortic development and anomalies. Semin Intervent Radiol 2007;24:141-52. Kieffer E, Bahnini A, Koskas F. Aberrant subclavian artery: Surgical treatment in thirty-three adult patients. J Vasc Surg 1994;19:100-9. Cinà CS, Arena GO, Bruin G, Clase CM. Kommerell's diverticulum and aneurysmal right-sided aortic arch: A case report and review of the literature. J Vasc Surg 2000;32:1208-14. Carrizo GJ, Marjani MA. Dysphagia lusoria caused by an aberrant right subclavian artery. Tex Heart Inst J 2004;31:168-71. Alcocer JJ, Spier L, Dyke CM, Griffith BP, Gammie JS. Traumatic rupture of an aberrant right subclavian artery. Ann Thorac Surg 2000;69:621-3. Levitt B, Richter JE. Dysphagia lusoria: A comprehensive review. Dis Esophagus 2007;20:455-60. Janssen M, Baggen MG, Veen HF, Smout AJ, Bekkers JA, Jonkman JG, et al. Dysphagia lusoria: Clinical aspects, manometric findings, diagnosis, and therapy. Am J Gastroenterol 2000;95:1411-6. Karcaaltincaba M, Haliloglu M, Ozkan E, Kocak M, Akinci D, Ariyurek M. Non-invasive imaging of aberrant right subclavian artery pathologies and aberrant right vertebral artery. Br J Radiol 2009;82:73-8. Harrison LH Jr., Batson RC, Hunter DR. Aberrant right subclavian artery aneurysm: An analysis of surgical options. Ann Thorac Surg 1994;57:1012-4. Valentine RJ, Carter DJ, Clagett GP. A modified extrathoracic approach to the treatment of dysphagia lusoria. J Vasc Surg 1987;5:498-500. Orvald TO, Scheerer R, Jude JR. A single cervical approach to aberrant right subclavian artery. Surgery 1972;71:227-30.